Yuliya is a Sr. Analyst of the Health Informatics Research (HIR) team, Princess Margaret Cancer Center. In the past 4 years Yuliya has worked closely with the UHN clinicians and researchers providing high quality technical and users support solutions on eCancerCare system, a disease-specific point-of-care tool that manages clinical data for medical and research purposes. 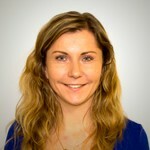 As a member of the Health Informatics Research team, Yuliya has been part of the coordination, development, implementation and support of many advanced and sustainable IT systems, including eCancerCare Suite, Distress Assessment and Report Tool (DART), Cancer Survivorship Care Plan (SCP), and TNM Validation e-survey for Ophthalmic Tumors. Yuliya is an international medical graduate (IMG) and has a Master of Health Administration from Cornell University, USA.